Today is the last day of Spring Break here in Lake Oswego so it may seem a bit early to be looking into summer camps for your kids, but take it from me—it’s not. 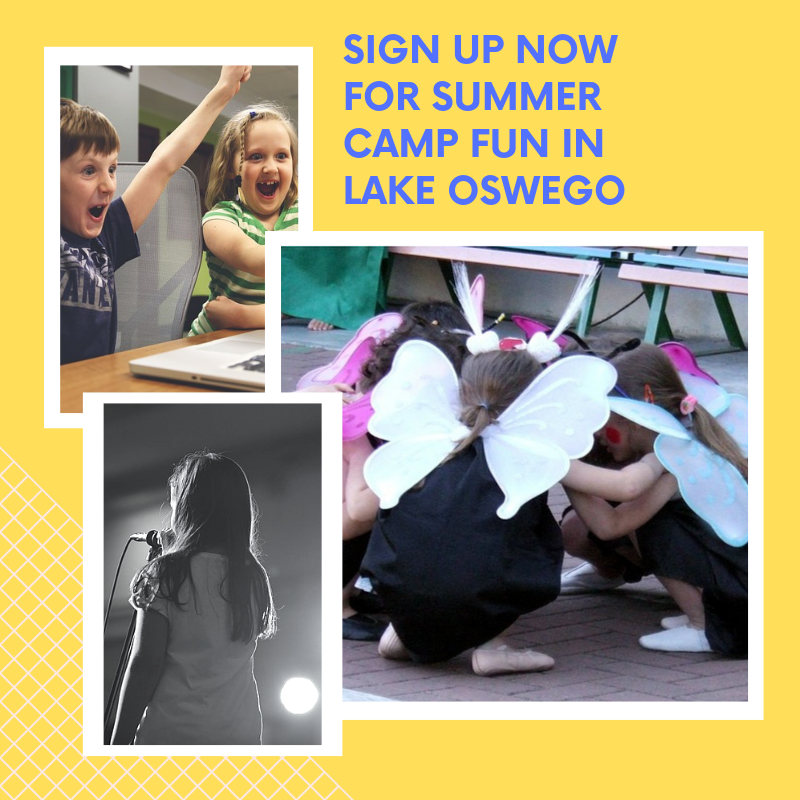 Registration for camps offered through the Lake Oswego Parks and Recreation Department opens next Monday, April 8 and classes available through the Lakewood Center are already taking enrollment. I’ll warn you—there are lots of options to choose from right now with all the popular regular offerings like Angelina Ballerina, Radical Robotics, Gaming and Coding, Teen Service Corps, LO Explorers, Wilderness Survival, Golf, Rowing and Tennis Camps being joined by some new offerings. So give yourself some time to sort through it all. And remember that in many cases, before and/or care is available for an additional fee. Miss Eve’s Fancy Nancy Camp for ages 3-5 draws inspiration from France as budding ballerinas dance, sing, and get artsy. Monday through Friday, August 12 through August 16 from 9:00 a.m. to 11:30 a.m. at Forest Hills Elementary, 1133 Andrews Road. Fees are $128/Resident; $148/Non-Resident. Class 19217. Sleeping Beauty Dance for ages 4-7 who want to dancer like Princess Aurora at her 16th birthday ball. Monday through Thursday, August 12 through August 15 from 9:30 a.m. to 12:00 p.m. at Academy of Ballet & Dance Arts, 311 B Ave., Suite Z. Fees are $4175/Resident; $201/Non-Resident. Class 19221. Sizzle and Stomp Camp for 6-10 year old’s who can’t get enough of So You Think You Can Dance. They’ll learn the basic elements of hip hop like popping, isolation and freestyleas well as how to choreograph their own routines. Monday through Friday, June 24 through June 28 from 1:00 p.m. to 4:00 p.m. at Forest Hills Elementary, 1133 Andrews Road. Fees are $138/Resident; $158 Non-Resident. Class 19245. Flashdance fans between the ages of 11-17 will get a chance to learn the moves that have made this movie a classic. Focus will be on ballet and contemporary techniques with a performance at the end. Monday through Friday, July 8 through July 12 from 1:00 p.m. to 4:00 p.m. at Forest Hills Elementary, 1133 Andrews Road. Fees are $138/Resident; $158/Non-Resident. Class 19246. Grease is the Word for those musical loving 11-17 year old’s. The focus will be on musical theatre and jazz while students learn routines to classics like “You’re the One That I want.” Monday through Friday August 12 through August 16 from 1:00 p.m. to 4:00 p.m. at Forest Hills Elementary, 1133 Andrews Road. Fees are $138/Resident’ $158/Non-Resident. Class 19247. Campfire Music Camp for ages 8-12 teaches the basics of ukuleles, guitars and hand drums so campers can entertain themselves and others. Offered through RMC Studios. Monday through Friday, July 15 through July 19 from 1:00 p.m. to 4:00 p.m. at Forest Hills Elementary, 1133 Andrews Road. Fees are $147/Resident; $170 Non-Resident. Class 19256. String Teens Camp for ages 11-17 is an introduction to a variety of string instruments including the ukulele and guitar. Offered through RMC Studios. Monday through Friday, August 5 through August 9 from 1:00 p.m. to 4:00 p.m. at Forest Hills Elementary, 1133 Andrews Road. Fees are $147/Resident; $170 Non-Resident. Class 19264. Scene of the Crime for ages 7-12 equips participants with the skills to figure out whodunit including how to collect, analyze and understand what evidence is telling them about a crime scene. Monday through Friday, July 15 through July 19 from 9:00 a.m. to 12:00 p.m. at Forest Hills Elementary, 1133 Andrews Road. Fees are $178/Resident; $205 Non-Resident. Class 19273. Harry Potter Magical Engineering using Lego® Materials for ages 5-7 will have your Harry Potter fans finding Platform 9¾, building Hogwarts Express, constructing Hogwarts Castle and challenging the Hungarian Horntail Dragon. Monday through Friday, July 8 through July 12 from 9:00 a.m. to 12:00 p.m. at Forest Hills Elementary, 1133 Andrews Road. Fees are $155/Resident; $178/Non-Resident. Class 19280 And for the full immersion experience, sign your potterheads up for the afternoon session where the magic continues as they build Diagon Alley, hop on Broomsticks and play Quidditch, duel the evil Lord Voldemort and hone their magical skills. Monday through Friday, July 8 through July 12 from 1:00 p.m. to 4:00 p.m. at Forest Hills. Fees are same as above. Class 19281. Intro to 3D—Handprinted 3D Creations Camp for ages 5-7. Their eyes will light up when they see the creations they can make with this 3Doodler Pen: robot rocket, triceratops and other models to take home. Monday through Friday 9:00 a.m. to 12:00 p.m. from August 12 hrough August 16 at Forest Hills Elementary, 1133 Andrews Road. Fees are $183/Resident; $211/Non-Resident. Class 19299. STEM Challenge and Harry Potter Using Lego® Materials for ages 7-12 is an all-day immersion into engineering and wizardry for Harry Potter fans. Participants will build trains, helicopters, treehouses and beam bridges and then let the action begin. Monday through Friday from 9:00 a.m. to 4:00 p.m. from August 19 through August 23 at Christ Church Parish, 1060 Chandler Rd. Fees are $304/Resident; $350/Non-Resident. Class 19284. Roblox Studio Programming and Game Development for ages 9-15. Calling all Roblox gamers for a chance to immerse themselves in a 3D world using programming that uses physics, LUA programming and creativity. Monday through Thursday, July 22 through July 25 rom 1:00 p.m. to 4:00 p.m. at Forest Hills Elementary, 1133 Andrews Road. Fees are $150/Resident; $173/Non-Resident. Class 19323. Baseball Camp for ages 8-10 and 11-13 presented by 503 Baseball, a local training facility. Focus will be on skill development through innovative drills. Tuesday through Thursday, July 16 through July 18 from 9:00 a.m. to 12:00 p.m. at East Waluga Park 15005 Quarry Rd. Fees are $95/Resident; $119/Non-Resident. Class 19442 for ages 8-10; 19443 for ages 11-13. Kids Create—Summer Stars for ages 4 through 8 inspires children to create, design and produce their own shows based around weekly camp themes. One week camps beginning July 8 and running through August 16. Monday through Friday from 2:00 p.m. to 5:00 p.m. Fee: $115. TV/Film Acting for ages 7 to 11 and ages 12 to 17. Two different sessions, one from July 22 through July 26, and another August 5 through August 9, give young thespians the opportunity to create and perform their own shows, practice improvisation and audition skills while gaining instant feedback. Monday through Friday from 1:00 p.m. to 2:30 p.m. for the younger group and 3:00 p.m. to 4:30 p.m. for the older. Fee: $120. Check the website for a complete schedule. And don’t forget—kids don’t get to have all the fun! The Lakewood Center offers summer classes for adults too including Acting for Non-Actors and Pocket Sketching Workshop. Things really pick up in the summer in Lake Oswego. Don’t miss a thing–subscribe to my blog by clicking the “Sign me up” button in the right hand column. The real estate market picks up too so if you are thinking of moving to, within, or out of Lake Oswego, give me a call at 503.939.9801 and check out my website. Let me put my 30+ years as a Realtor in Lake Oswego to work for you! This entry was posted in Lake Oswego Recreation, Summer in Lake Oswego, Things to Do in Lake Oswego. Bookmark the permalink.